Complex systems call for a hierarchical description. Analogously, the engineering of non-trivial MASs (multiagent systems) requires principles and mechanisms for a multi-layered description, which could be used by MAS designers to provide different levels of abstraction over MASs. 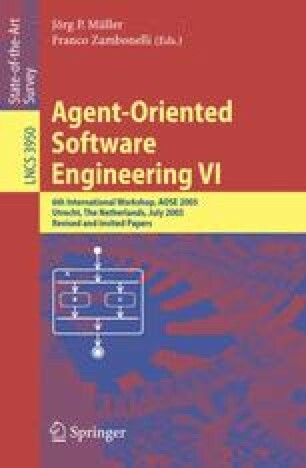 In this paper, we first advocate the need for zooming mechanisms, promoting a coherent and consistent multi-layered view of agent systems. After surveying the best-known AOSE methodologies, we focus on the scaling mechanisms of the OPM process-oriented methodology. Then, by adopting SODA as our reference, we show how an AOSE methodology can be enhanced with simple yet expressive zooming mechanisms. Finally, we present a simple case study where the enhanced agent-oriented methodology (SODA +zoom) is exploited and put to the test.